It is one thing to make a misspelling in an email to your boss, another to misspell the name of your airline… on your own plane… in massive lettering. The wrong name on the right plane. 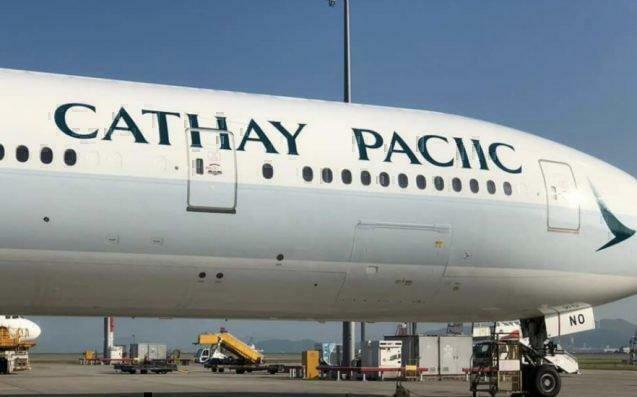 Cathay Pacific has misspelt its own name on one of its planes. When planes have a major overhaul, replaced parts and undergo refurbishment, airlines can sometimes choose to repaint the plane (to remove signs of wear and tear). In the case of this plane, Cathay Pacific Boeing 777-300 (registration B-HNO), went for its next maintenance check-up (it has been flying since 2004) and got repainted. What they did not expect is for the sign painters to miss out on some critical letters. 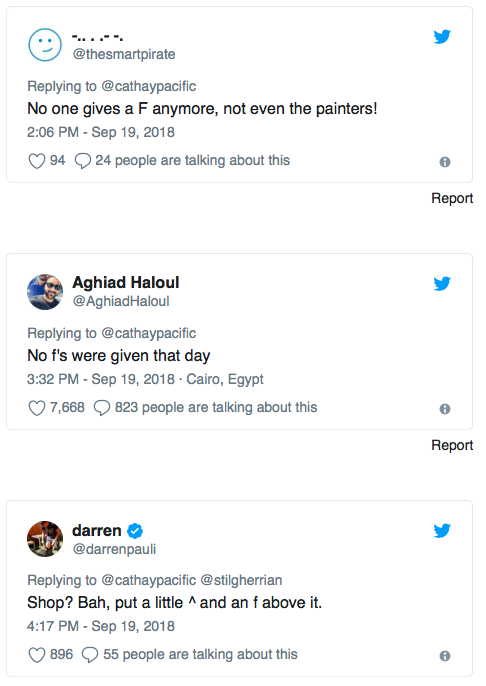 Apparently, the painters stood back after painting and said… yep, that’s right. Or perhaps it’s like the famous comendian Mitchell quote “For $100 I’ll paint it how you spell it here [on paper], but for an extra $10 I’ll double check”. Once the plane’s maintenance was complete, it flew on from Xiamen to Hong Kong to return to service. Only once it landed, it upstaged the donation of the first 777. 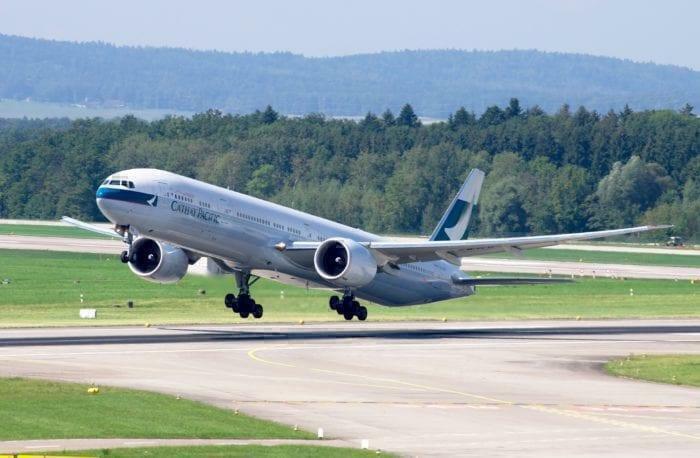 The world’s first B777, owned by Cathay Pacific, is taking its final flight. 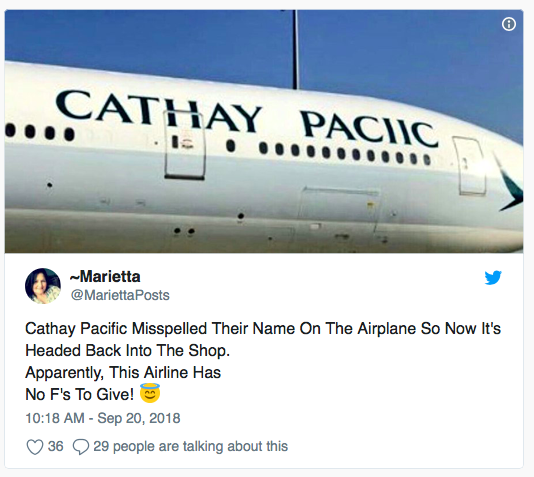 Cathay Pacific themselves seem to be a good sport about it and have since tweeted that the plane is en route to be repainted. They have covered up the last lettering of the plane to ensure that no more photos can be taken. We applaud their good sense of humour, and agree that their “special service does come from the hart” [sic].